In the mid-1980s, American baseball card collectors were surprised to find a previously unknown group of baseball cards displayed at the Parsippany National card show. In 1997, a second group of these unusual cards showed up at auction. 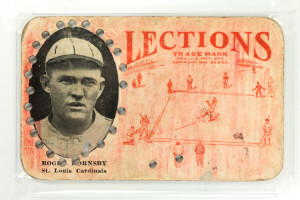 The origin of the “Lections” baseball cards is still shrouded in mystery. It’s estimated that only 40-50 cards from the set still exist today – and an additional four Lections baseball cards have just been discovered from an upstate New York estate and are now being offered for sale in the Nine Caroline Antiques store. The exceedingly rare group includes a Babe Ruth baseball card, a Roger Hornsby baseball card, a Howard Ehmke baseball card, and a “Bob” Emil Meusel baseball card. 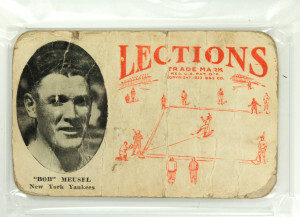 The Lections baseball cards date to around 1923. Each card is printed on a thick cardstock and features a black and white photograph of the featured player, with the name and team printed below. 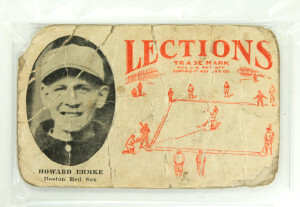 The rest of the card is printed in green or orange ink, with a drawing of a baseball game in progress to the right underneath “Lections / Trade Mark / B & B Co.” The cards are blank on the back. However, a first-hand account from a gentleman who actually collected Lections baseball cards in his youth sheds some additional light on the subject: the Lections baseball cards were probably handed out to children in conjunction with “election cards” handed out to adults at public events or fairs in Albany, New York. The grownups’ election cards were handed out by public officials running for election. The Lections baseball cards were handed out to children at the same time, all in an attempt to win the support of both children and their voting parents. Since the cards were only handed out over the duration of a local fair (just a few days in a small area), their existence is very scarce and as such very rare. 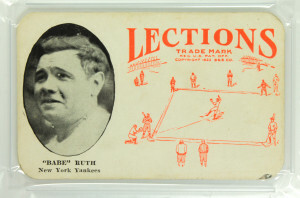 Most excitingly, one of the Lections baseball cards discovered in this new group is that of the renowned Babe Ruth, the Great Bambino himself, the famed pitcher/outfielder for the New York Yankees (1920-34). Only seven PSA graded Babe Ruth Lections baseball cards are known to exist, and only one card is graded higher than our “Good 2” Babe Ruth baseball card. This is an exciting group of Lections baseball cards. The cards came to us from an upstate New York estate, as befits a group of cards with a very specific and localized origin. Each of the Lections baseball cards has been graded by the PSA (Professional Sports Authenticator), the world’s largest third-party sports card authentication service. All of the original 1923 Lections baseball cards can be found in our store by clicking here.